Brompton, Brompton, Straight Outta Brompton. 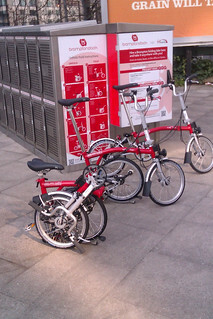 New Brompton dock launches in in Manchester. Bicycle sharing is becoming increasingly popular in cities around the world. London has Boris Bikes, Paris has Vélo Liberté: Vélib’ and New York should soon have thousands of new Bixi-bikes this summer. There are scores of public cycle hire schemes in other cities. With the health benefits of cycling well documented  and with the potential reduction of traffic congestion which blight many of our cities, it’s not difficult to see why sharing schemes are gaining popularity. They are beautifully designed and built bicycles, folding is very simple and ingenious (once you’ve worked it out). The bikes have high quality components (hub dynamo), shimano gears etc Quality comes at a price and Brompton bikes aren’t cheap. Although hiring is cheap (see below), you’re liable to a ~£700 replacement charge if it gets stolen. Ouch! You can take this bike anywhere (train, office, cupboard, boot of your car etc). Handy if you live in a flat with no outdoor cycle storage. No lock provided to secure the bike. You can just fold it away but this isn’t handy if you’re just popping into the shop. It’s probably not a great idea to lock it up for long because these expensive bikes will be a target for theft. Bromptons have a pretty sturdy construction, which is just as well because hire bikes have to take a fair amount of abuse. Bromptons are quite heavy, weighing around 12 kilos. You’ll notice the weight when you try to carry the bike with one hand onto a train. On the road, they’re not as zippy as a lighter machine and the small wheels give a different handling to larger wheeled bikes. No luggage carrying equipment comes as standard, there is no pannier rack to put things on. Comes with a pump, neatly tucked away on the frame. A minor point, but I found the pump can fall off easily and be tricky to get back on. A great way of “try-before-you-buy” a Brompton of your own. Prices look reasonable to me and there are a wide range of pricing options starting from just one week hire and membership for a mere ten quid. You might be reluctant to return it to the dock, and may even want to buy one of your own! Personally I think Brompton Dock is a great idea and it will be interesting to see how successful it is. If Brompton Dock, and other bicycle sharing schemes, get more people out of cars and onto bicycles and trains then it can only be a good thing. 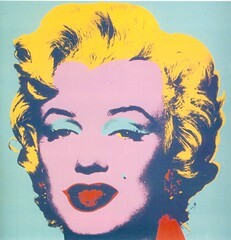 Try for yourself, you can hire one from a UK station near you in 2012. (Disclaimer, I’m not being paid by Brompton Dock or Brompton Bicycles to write this review, but they did give me a free T-shirt for being their first (!) customer).